Bamber Bridge are still hopeful of enticing David Dunn to the Sir Tom Finney Stadium this season. The former Blackburn Rovers midfielder – who was sacked as player-boss of Oldham Athletic earlier this month – stated a couple of weeks ago that he was open to the idea of continuing his playing career in non-league football with Brig. It is fair to say the ex-England international’s announcement caught the club slightly off guard at the time and whether it was said with tongue in cheek, only he knows. Currently, Dunn has yet to sign, but his good friend Neil Reynolds – who is the assistant manager at Irongate – said there is a possibility that the 36-year-old could be wearing the club’s black and white colours before the season’s out. In a further twist to the tale, Dunn’s former Rovers team-mate Lucas Neill could also be tempted by a move to the NPL First Division North outfit. “David’s son and my son are at Blackburn Rovers Academy and so is Lucas Neill’s son. “I have got to know them both through that. “It was David who came out and said that he could play for Bamber Bridge live on the radio. “I had a pint with him on Wednesday night and I said if he wants to come down to Bamber Bridge – whether that’s to train or play one game – he’s more than welcome to. “I would say that the chances of it happening are minimal, because he wants to get back into management. “It might happen for one game and then David gets a job in management next week. “So I’m not going to say, ‘Yes he’s coming or no he’s not coming’. “But you never know. If he wants a game or to train, then I’ve told him to feel free to come down. The same goes for Lucas Neill. “If we can get David or Lucas down, then it will be great for Bamber Bridge. “But it’s really all down to what David and Lucas want to do. Should Dunn sign for the club then it would go a long way to filling the hole left by ex-PNE stars Paul McKenna and Brett Ormerod. 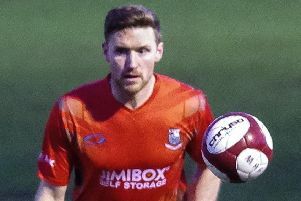 McKenna decided to quit the semi-professional game at the start of the year and yesterday signed for local amateur club Longridge Town of the West Lancashire League. Ormerod announced he was hanging up his boots last week, although Reynolds has not given up hope of persuading him to come out of retirement. “It’s a massive blow to lose Brett,” Reynolds said. “We have to pinch ourselves to think that we have had him, Paul McKenna and Jon Macken at the club. “He is still signed on for us and although he said he’s retired, we might be able to get him out on the pitch again. Brig will be looking to get back to winning ways this weekend when they host bottom club New Mills this weekend. Reynolds watched his men suffer their first defeat of 2016 when they became the 11th successive victims of Farsley Celtic last weekend. Their scheduled fixture against Northwich Victoria in midweek was postponed.